Subject(s): Church management, Church work - Evaluation, and Strategic planning. Projects That Matter introduces project leaders and teams to the five basic elements of project design and describes in detail a six-step process for designing and implementing a project evaluation and disseminating evaluation findings. Written for the nonexpert, leaders in religious settings will find Cahalan’s guidance clear and invaluable. Presenting evaluation as a form of collaborative inquiry, Cahalan show how leaders can use evaluation design to develop effective project plans and prepare case statements for donors or grant proposals for foundations. She introduces project planning and evaluation as mission-related practices and invites leaders to consider how their tradition’s particular mission and beliefs influence the way they plan and evaluate. 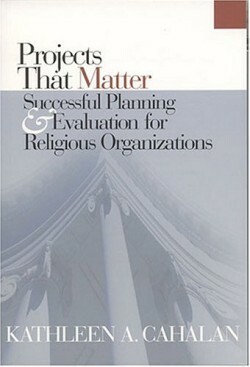 Cahalan concludes the book by making explicit her own theological presuppositions – that the virtues of discernment, stewardship, and prudence are essential for good project planning and evaluation. Kathleen A. Cahalan is assistant professor of Pastoral Theology and Ministry at St. John’s University School of Theology & Seminary in Collegeville, Minnesota. She served as evaluation coordinator for Lilly Endowment’s religion division from 1996 to 2000.